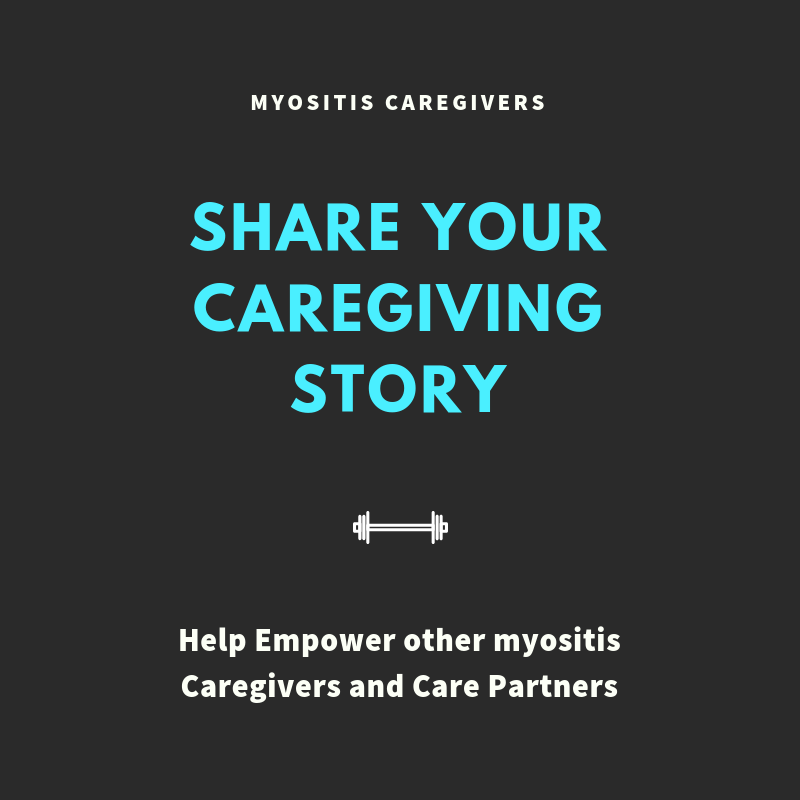 Caregivers and Care Partners play an important and ever-evolving role in the lives of those with rare, chronic autoimmune illnesses such as the various forms of myositis. 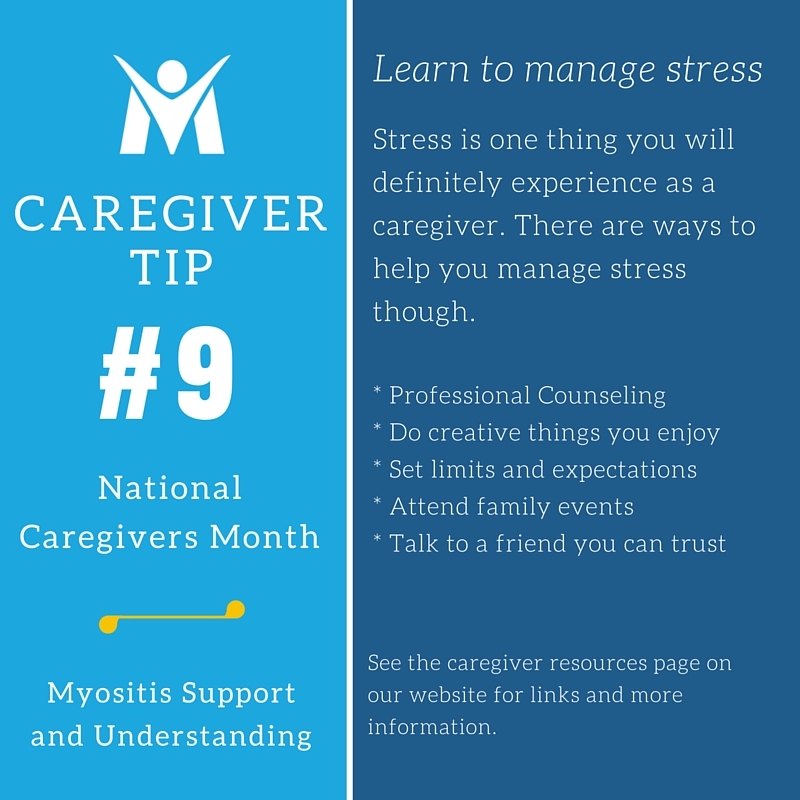 As a caregiver, you likely have many questions and concerns. We are continuing to grow a vast network of education, support, and resources just for you. 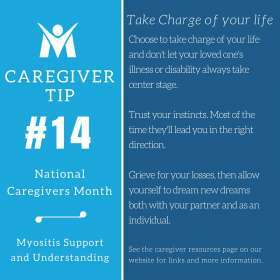 Our myositis caregivers allow us, as patients, to live our best possible lives. Knowledge is Power. 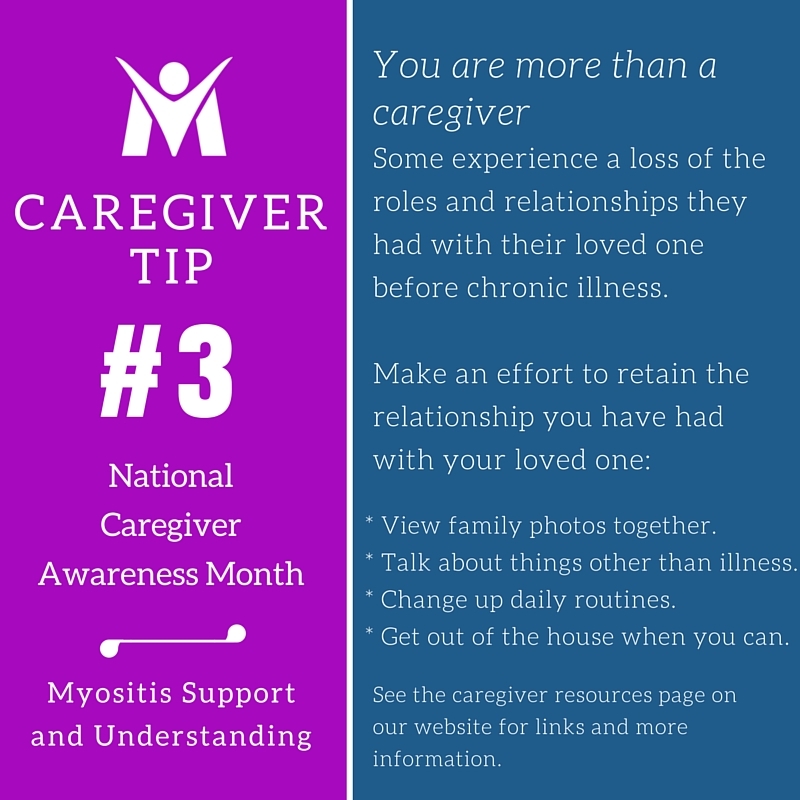 Learning more about myositis is a great first step in your role as a caregiver. In our case, myositis refers to the Idiopathic Inflammatory Myopathies (IIM’s), the rare, chronic autoimmune forms of myositis. 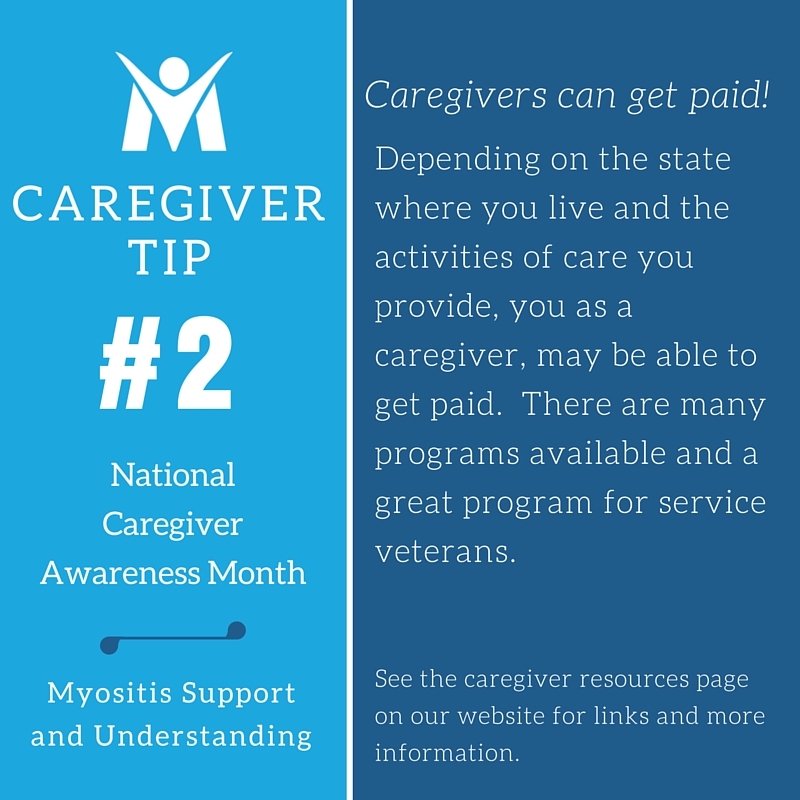 Learn more about the different types of myositis. 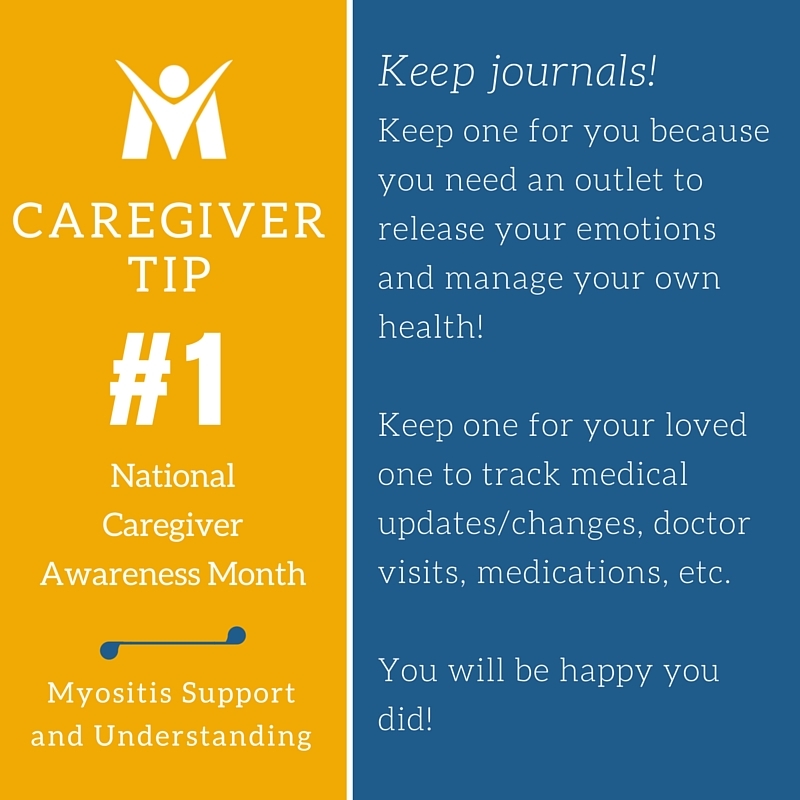 We have put together some helpful tools, resources, and downloads for patients and caregivers. There are currently no specific treatments available for any form of myositis. Treatments used were created for and are used with other autoimmune diseases. Getting involved in a clinical trial or research study can help in various ways. Get your clinical trial match, a program in partnership with Antidote Technologies, by visiting our clinical trials page. 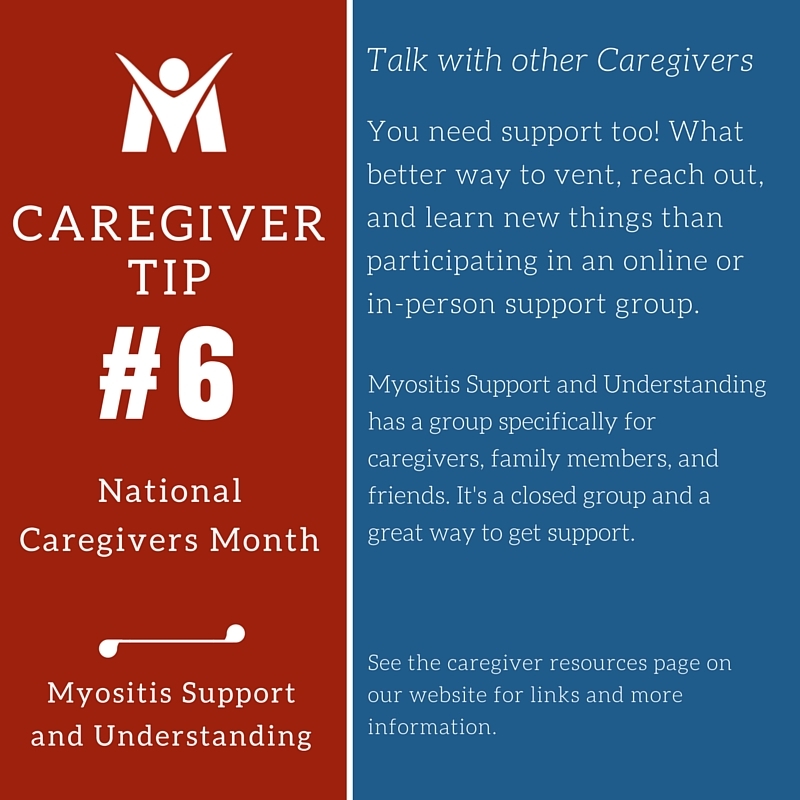 Family caregivers for those with myositis can often feel very lonely. But, you are NOT alone! 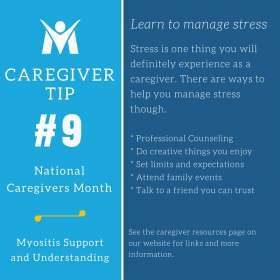 We have several caregiver support options to help you in this difficult role. 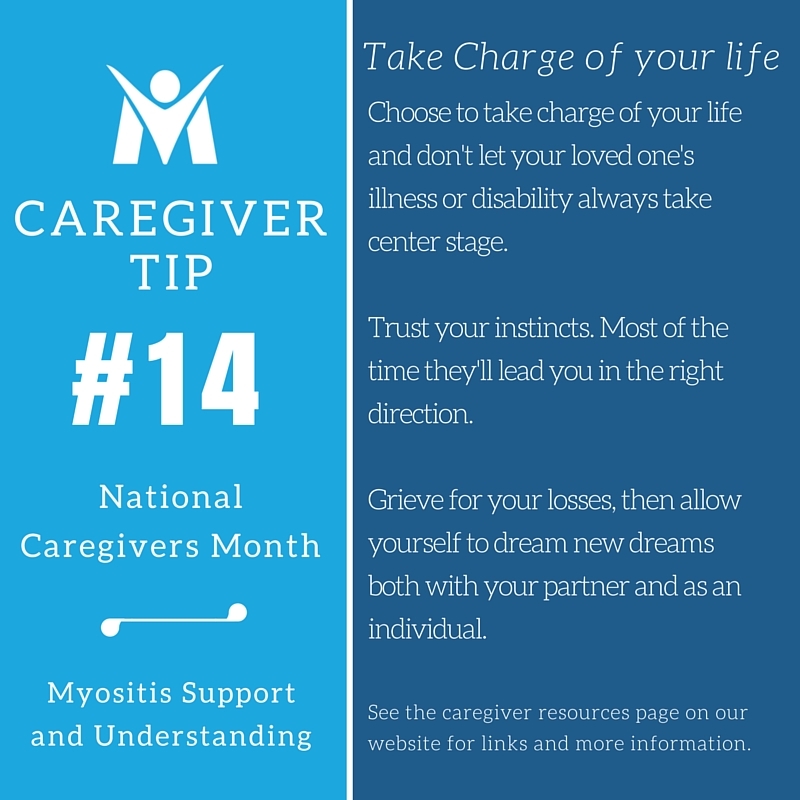 Barbara Deer, a spouse and caregiver of a patient with polymyositis, has provided us with a day-by-day listing of caregiver affirmations that can help caregivers focus on themselves and realize how special they are, and our wish for them to care for themselves. Caregivers have always been a huge part of MSU and continue to be leading players in how we move forward. Download the affirmations in a PDF file and/or download the daily graphics you can print and share with others. Keep one for you because you need an outlet to release your emotions and manage your own health! 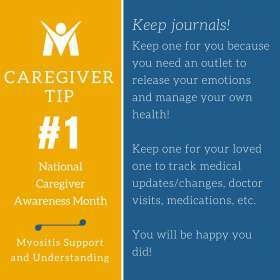 Keep one for your loved one to track medical updates/changes, doctor visits, medications, etc. 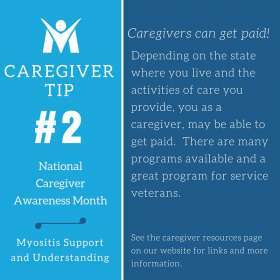 Depending on the state where you live and the activities of care you provide, you as a caregiver may be able to get paid. There are many programs available and great programs for service veterans. See our veterans resources page. Talk about things other than illness. 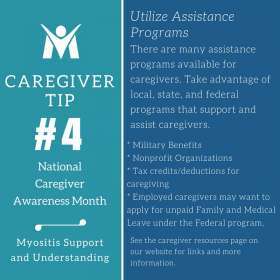 There are many assistance programs available for caregivers. 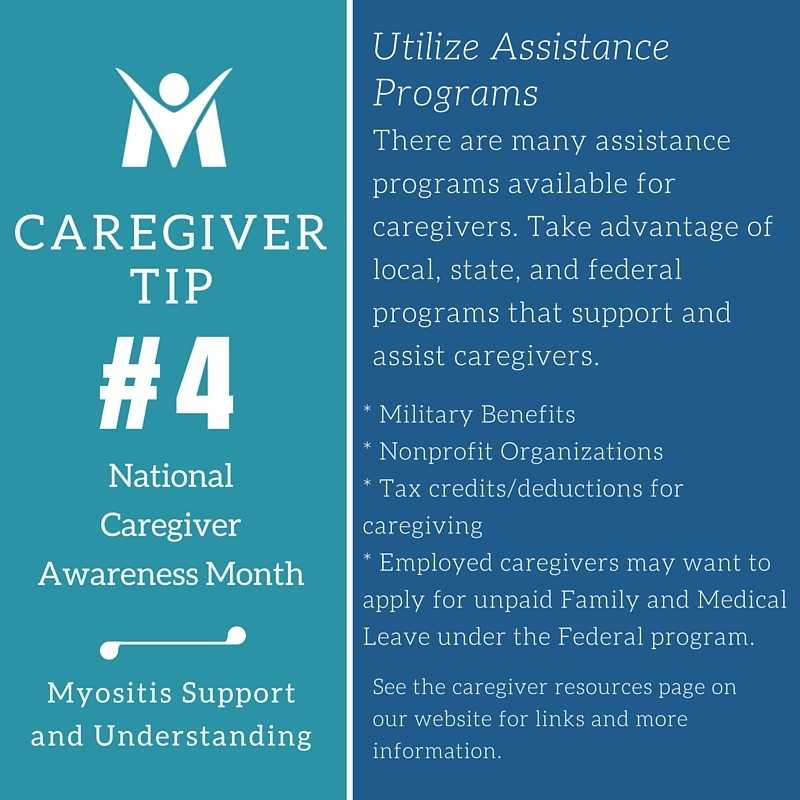 Take advantage of local, state, and federal programs that support and assist caregivers. Let’s face it, you cannot do this alone. There are many people in our lives waiting to be asked to help. Utilize that help! You need support, too! What better way to vent, reach out, and learn new things than participating in an online or in-person support group. Myositis Support and Understanding has an online group specifically for caregivers, family members, and friends. It’s a closed group and a great way to get support. Request to join using the link below. This group is not for patients. 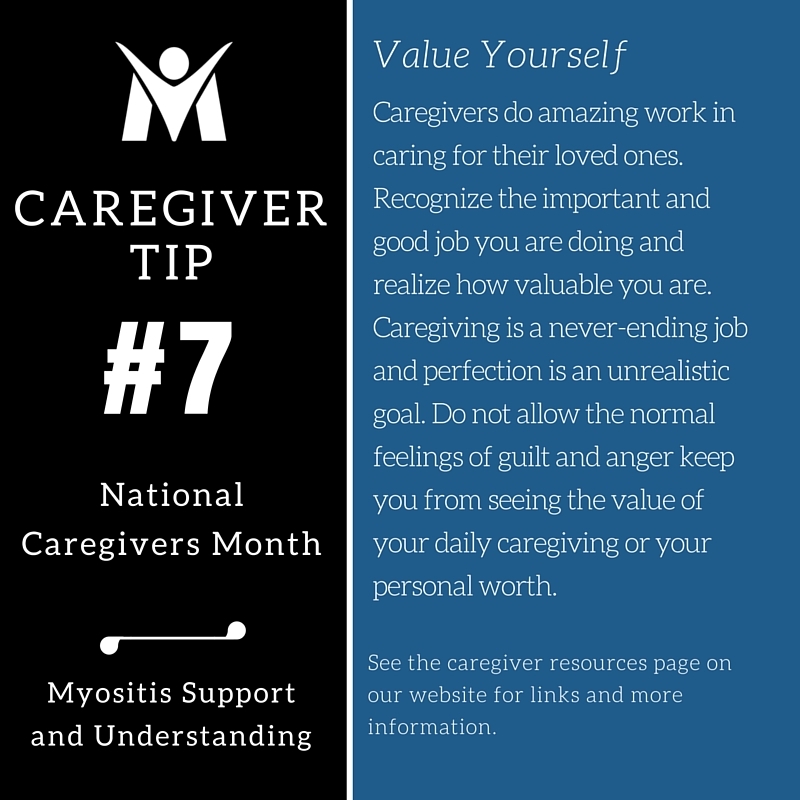 Caregivers do amazing work caring for their loved ones. Recognize the important job you are doing and realize how valuable you are. Caregiving is a never-ending job and perfection is an unrealistic goal. 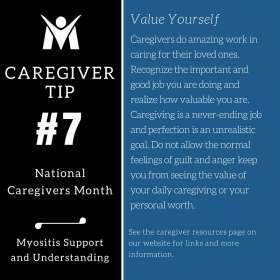 Do not allow the normal feelings of guilt and anger keep you from seeing the value of your daily caregiving. 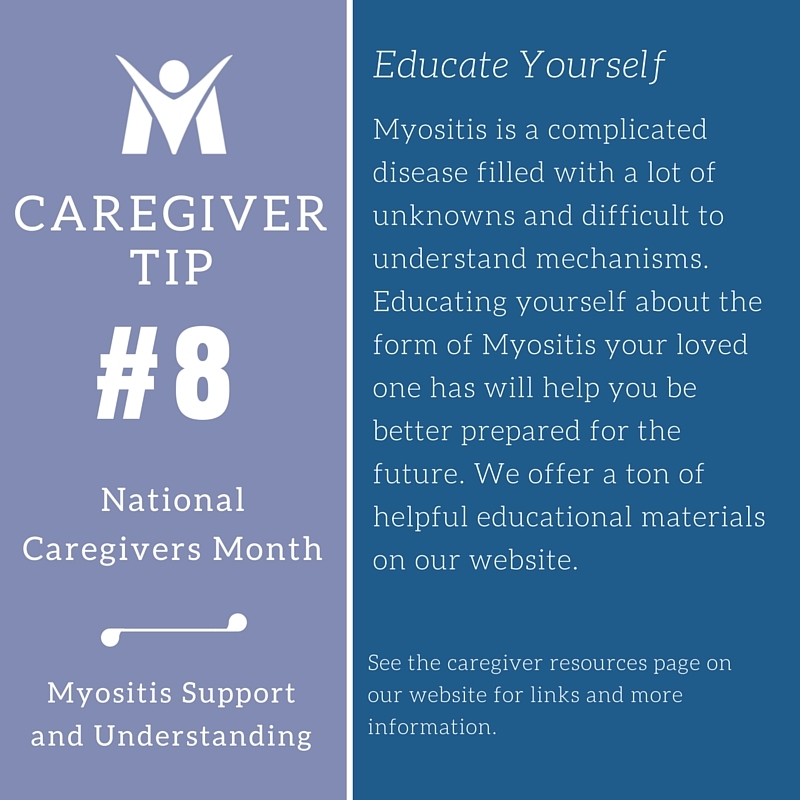 Myositis is a complicated disease filled with a lot of unknowns and difficult to understand mechanisms. 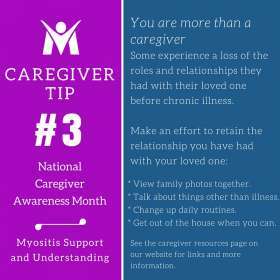 Educating yourself about the form of Myositis your loved one has will help you be better prepared for the future. We offer helpful educational materials on our website. Start by visiting the Myositis section. 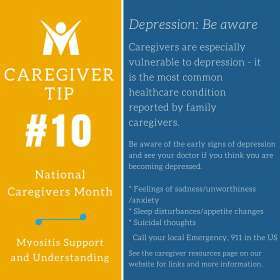 Caregivers are especially vulnerable to depression – it is the most common healthcare condition reported by family caregivers. 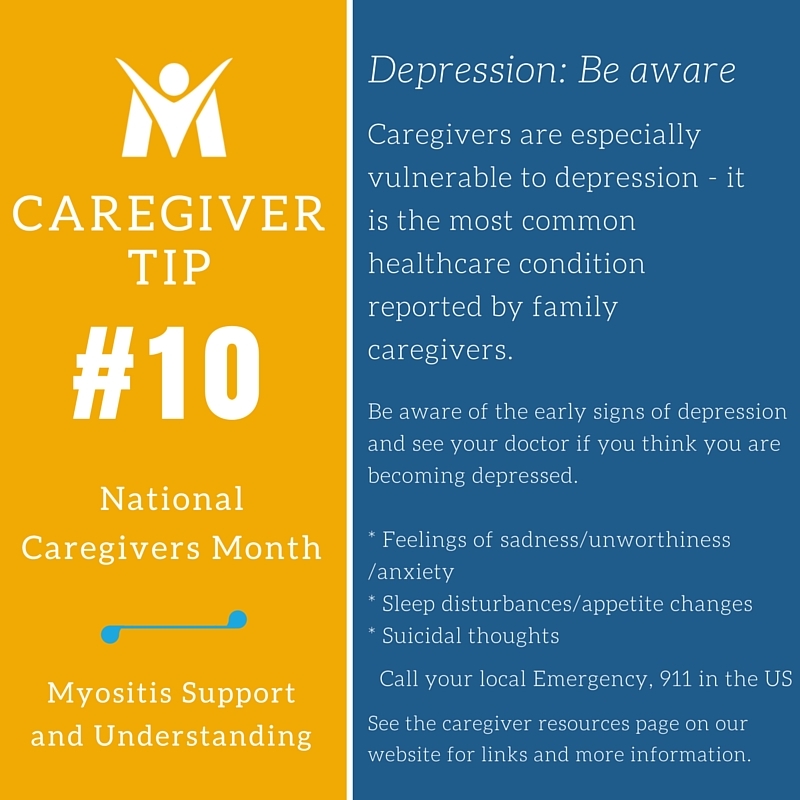 Be aware of the early signs of depression and see your doctor if you think you are becoming depressed. 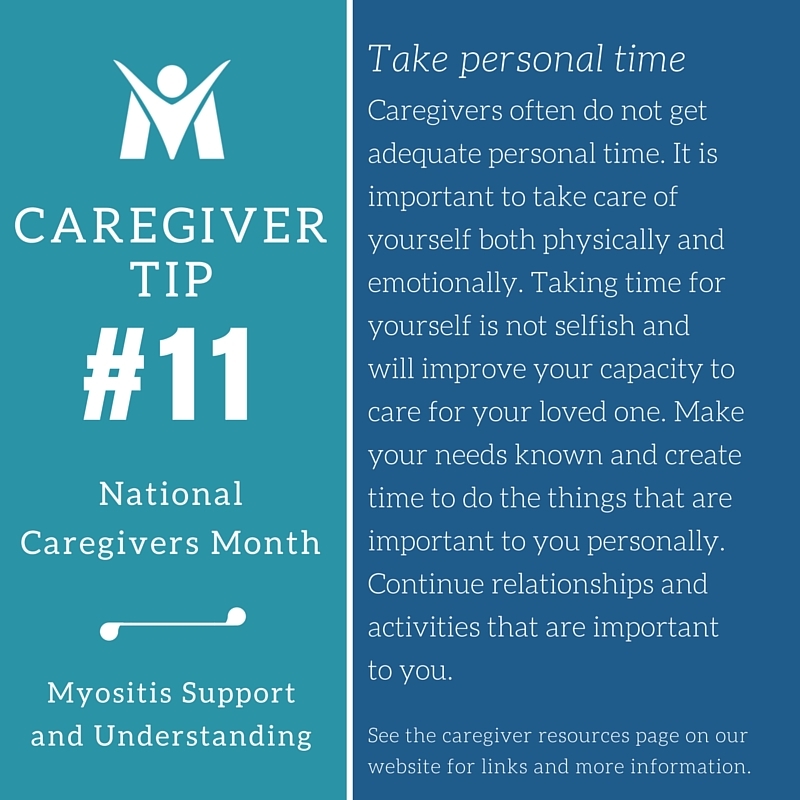 Caregivers often do not get adequate personal time. It is important to take care of yourself both physically and emotionally. Taking time for yourself is not selfish and will improve your capacity to care for your loved one. Make your needs known and create time to do the things that are important to you personally. Continue relationships and activities that are important to you. 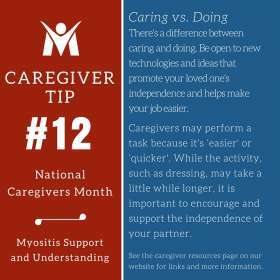 Caregivers may perform a task because it’s ‘easier’ or ‘quicker’. 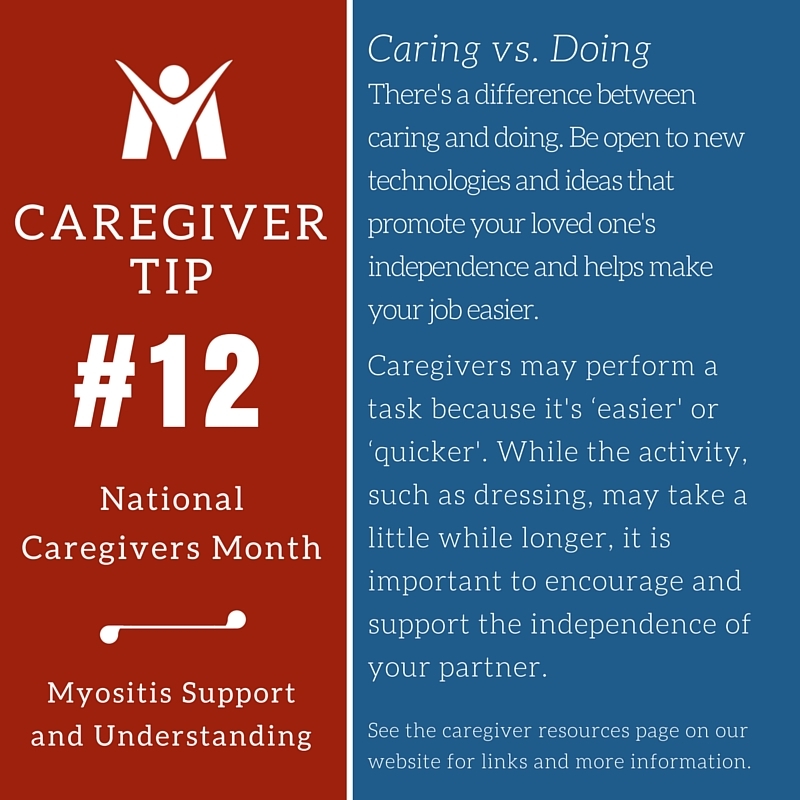 While the activity, such as dressing, may take a little while longer, it is important to encourage and support the independence of your partner. 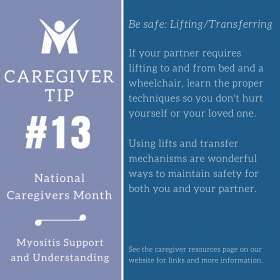 If your partner requires lifting to and from bed and/or a wheelchair, learn the proper techniques so you don’t hurt yourself or your loved one. 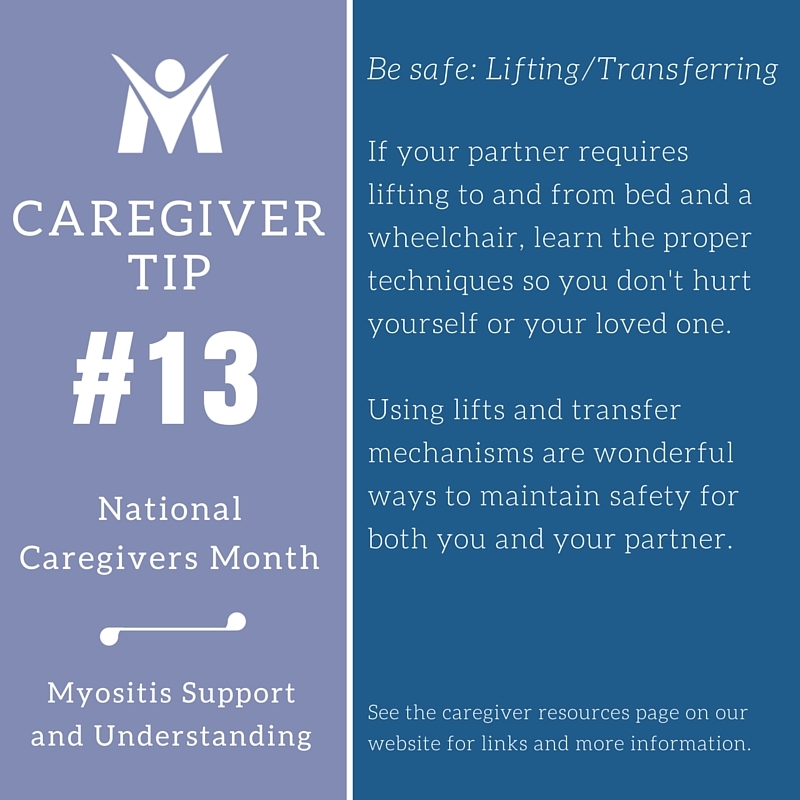 Using lifts and transfer mechanisms are wonderful ways to maintain safety for both you and your partner. Grieve for your losses, then allow yourself to dream new dreams both with your partner and as an individual. 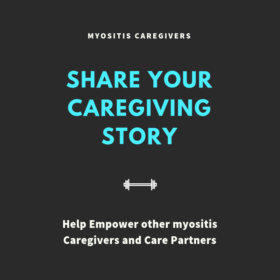 Each form of myositis is different and brings unique challenges. Whether they are specific adaptations you have made in your home or daily life to help make thing easier or how you have created a journal or schedule that helps keep your better organized and prepared for unexpected circumstances. Share your unique story with us so we can share it publicly.